My secretary question made me ponder deeply. As Christians we all surely know that there is nothing impossible to God. But the problem is how far we truly believe it? Have we applied it in our daily lives? How far our obedience to obey doing what God commanded, even when we have to do something that seems doesn’t make sense? In our daily lives, we found a lot of people that easily discouraged when confronted by adversity, moreover if our logic says that it is impossible to be overcome. Even worse, if we don’t believe in what we do, although we know that it is in accordance with God’s guidance. In that circumstance, we often forget one of God’s characteristic that He has unlimited power. We become doubt because we feel it is impossible to find the way out of our difficulties. Actually, if we want to spend some time to learn and contemplate what God says in the Bible, we will find a lot of events and the real examples of how God did many miracles which by human logic is very impossible. That was so true that there is no wind, rain, and maybe even not cloudy. Although it sounds very strange and illogical, if God had promised, God definitely will keep His promises. If we read this passage till the end we know that finally what God commanded to them was not in vain. God proves His words. Not only an abundant water but God even gave them a victory against the Moab. If this story were not powerful enough to convince us that indeed nothing impossible for God, let’s look to another story. Let’s briefly have a look to the story of Gideon in Judge 6. When the Israelites were oppressed by the Amalekites and the Midianites, God sent His angel to meet Gideon and said that God chose Gideon to defeat the Amalekites and the Midianites. (Verse 11-12) What is the impossible thing that happened in this story? Let’s see a map of the power of the both parties. The Midianites and Amalekites have so many people. Was mentioned in the Judges 7:12: The Midianites, the Amalekites and all the other eastern peoples had settled in the valley, thick as locusts. Their camels could no more be counted than the sand on the seashore. While in the Gideon’s side, God said to Gideon: “With the three hundred men that lapped I will save you and give the Midianites into your hands. Let all the others go home.” (Judges 7:7 NIV) logically, it was a highly impossible thing. How it is possible with only three hundred people could defeat the Midianites that have uncountable number. Through this story once again we see that something is impossible for us, it is not impossible for God. With God’s inclusion and guidance Gideon and his people finally can defeats the Midianites. My beloved readers, whether right now we are in facing tribulations and we feel that all of it is impossible to be resolved? Or we’re in doubt doing something that God commanded? 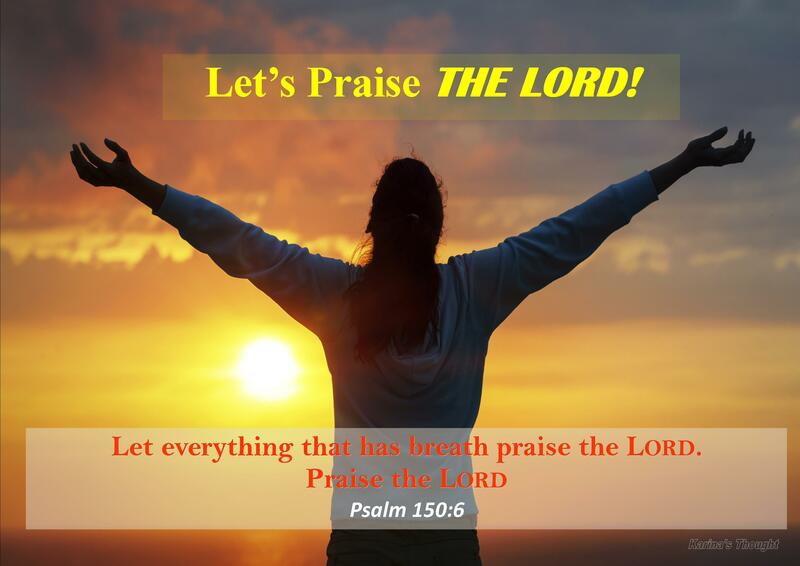 This evening, please allow me to encourage all of us to bring every of our severe problems and difficulties through prayer to God. Let Him help us to solve our problems by His own way. 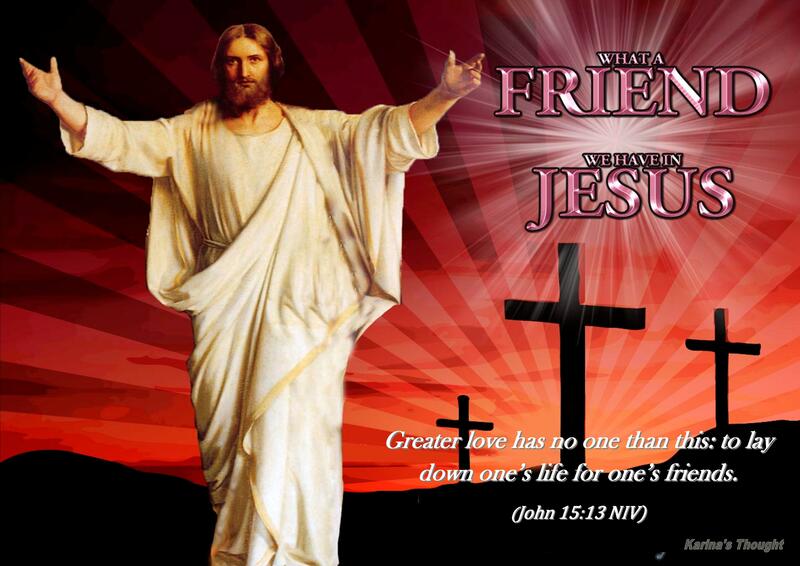 Please always remember and bear in our heart and mind that for with God nothing shall be impossible. Perhaps our logic and mind says impossible but neither to God. All that happened thousands of years ago will still be going on in our lives today. In my personal life, many times I had many hard problems and seem it is impossible to be resolved. But many times too God shows His marvelous way, far away beyond my logic and thought to solve my problems. Everything that is not easy for us is an easy thing in the God’s eyes. 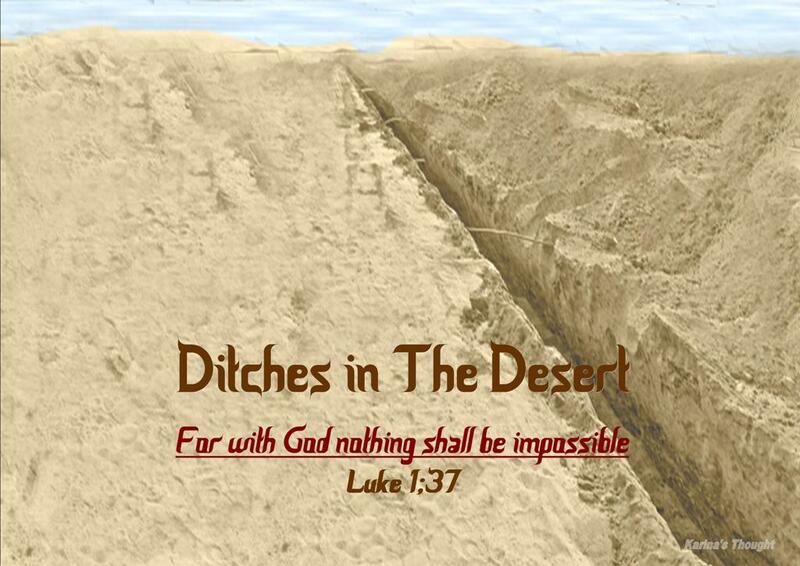 If God commanded us to dig “ditches in the desert” we just need to obey to do what He commanded though it sounds impossible. The Israelites chose to obey to what God said and finally they got double blessings. God gave the water that they need and a victory against the Moab. Gideon also always obedient to did what God commanded and he can defeats the Midianites with only three hundred people. We need make a step of faith to get God’s promises. God’s promises and blessings will not come instantly. We have to do our part first, and God will do His part. The step of faith that has made by the Israelites is build ditches. Gideon had step of faith by decreasing the number of his people from thirty-thousands to only three hundred people. We should not just remain silent waiting God’s blessings. We have to act to do something with firm faith, walk deeper into the closer relationship with God, and always involve Him in all things in our lives. We also have to believe. Distrust and doubt is often become a stumbling block and an obstacle for us to receive God’s Miracles. Please remember that our God is more than capable to doing unpredictable miraculous things. God be able to doing unthinkable and unreachable thing. Although it sound so odd, The Israelites completely believe that through the ditches that they make, God’s power will work. Gideon was truly believed that God will always be with him. We have to believe God will be able to help us through His amazing way. Everything is impossible will be possible if we believe. My dear friends, if today we got the same question as my secretary question, what is our answer? Let’s confidently answer that question: “Yes! For with God nothing shall be impossible as long as want to completely obey, always walk in firm faith, and believe.” Amen.